Editor’s note–To those who remember him when he lived on the Morongo Reservation in the 1930s, Sadakichi Hartmann was a tattered, scrawny asthmatic who passed his days painting his cherished Mt. San Jacinto. To old friends like Walt Whitman, Ezra Pound and Alfred Stieglitz, he was the King of Bohemia–an influential modernist art critic, artist and poet. Banning historian Bill Bell has spent years researching Sadakichi, one of the most important overlooked historical figures of our region. Here is Part Two of his Three Part article. 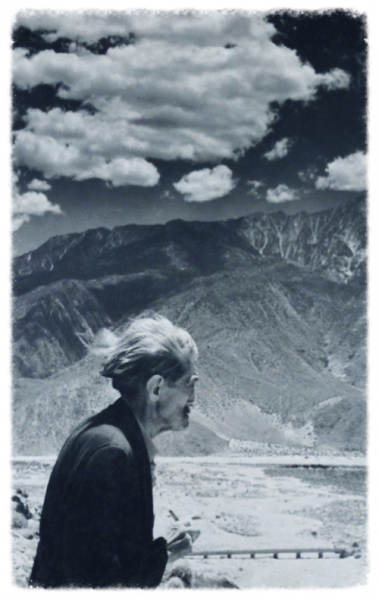 “Like a snow ghost in feathery flight” Sadakichi Hartmann floated in and out of the San Gorgonio Pass from the 1920s to the 1940s. (The line is from Sadakichi’s poem, “Snowfall.”) Sadakichi Hartmann, 1868-1944, was a world renowned artist, art critic, author, philosopher, and poet who divided his time between Europe, Hollywood, New York and ultimately the San Gorgonio Pass from the late 1880s until 1944. Sadakichi’s Final Days at Cat Claw Siding, by Cliff Wesselman. Courtesy of UC Riverside Special Collections. From 1906, until the end of his life Sadakichi continued writing books and poetry, lectured on art worldwide (at least 1700 lectures), and assisted in establishing art collections, libraries and museums across the United States. He was highly sought after as an art expert and was a mentor to burgeoning artists. For the first two decades of the 1900s Sadakichi lived and worked back and forth between Europe, New York and Los Angeles. His book My Theory of Soul Atoms was published in 1910, and his The Last Thirty Days of Christ (in Charlie Chaplin’s words, “the best story ever written about Christ”) was published in 1920. The Banning Public Library has non-circulating copies of both of these books. The large amount of time Sadakichi was spending in the Los Angeles area gave him the opportunity to learn about the nearby San Gorgonio Pass, its very low cost of living and its climate conducive to relief for lung conditions. It was his asthma which ultimately drove him to make a move to Beaumont in 1923. He would often say that he was almost immune to his asthma as long as he remained in Beaumont. He could also remain within striking distance of Los Angeles and his many contacts there, both professionally and socially. Albert Einstein, Irving Berlin and countless other known celebrities frequented the San Gorgonio Pass in the 1920s, 30s, 40s and 50s, usually on their way to or from Palm Springs. Sadakichi is the only one who was a long term resident of the Pass from 1923 to 1944. His Hollywood friends made frequent trips to the desert resort towns and Sadakichi was able to hitch rides with them between the two areas. 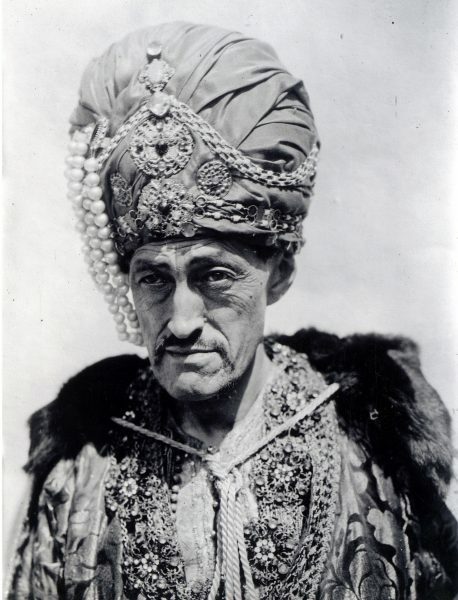 Sadakichi in his role as the court magician in Thief of Bagdad. As he was moving to Beaumont in 1923, Sadakichi was simultaneously working with Douglas Fairbanks on the classic silent film, Thief of Bagdad. Sadakichi played the role of the court magician and the money he made from the movie helped sustain him for awhile in Beaumont. When Sadakichi first moved to the Pass he lived with his wife and children in a house near the corner of 13th and Michigan in Beaumont. He later lived in a house on Magnolia Ave., south of 5th Street and near the Southern Pacific Railroad tracks. During his residency in the Pass few were aware of their famous neighbor whose notoriety was at its peak around the turn of the 20th century. Now, nearly a century later, he is even less known though his influence in the art world is timeless. It must have been difficult for Sadakichi to adjust to life in the San Gorgonio Pass. Who would he find to talk with about his important role in the history of art and the famous people he knew? Where would he find the intellectual camaraderie he was so accustomed to? It didn’t take long for him to find the answers in his friendship and collaboration with Beaumont Mayor Guy Bogart. After researching Guy Bogart’s and Sadakichi’s biographies I haven’t been able to determine exactly when or how they met although they both lived in the Los Angeles area prior to 1923, and traveled in parallel circles of art and film. It is likely they may have met in Hollywood before moving to Beaumont and shared their enthusiasm for relocating to the Pass area. Or, they may have first met in Beaumont after both relocating here. It wouldn’t have taken long for the two of them to find each other given their common interests. Bogart would have undoubtedly known who Sadakichi was and may have initiated their collaborative relationship. Guy Bogart opened his home on Euclid Avenue to Sadakichi and was unabashedly honored to be associated with him. He wrote numerous articles about Sadakichi and assisted him in many ways, sometimes financially. Speaking of Sadakichi, Bogart wrote, “He is not the cynic some have hailed him. His mad Bohemian dances do not make him a clown. There is no bitterness in his make-up, nor any sense of responsibility to standards which have never registered. He is an appreciator of art, discriminating and concrete, with the power of literature in which to tell his views.” In Bogart’s opinion Sadakichi was a true poet. He would publish and revise his writing constantly, often never getting a poem completed to his liking. 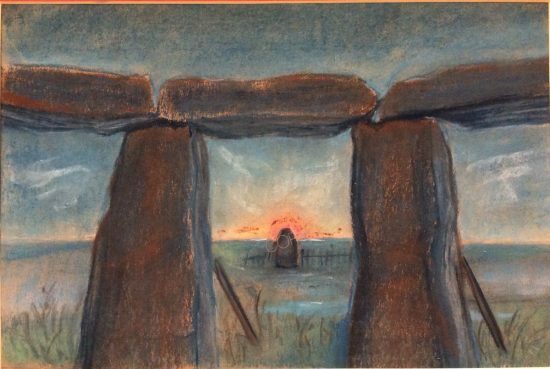 Sadakichi’s 1928 painting of Stonehenge. Beaumont residents who knew of Sadakichi and his family’s predicament criticized him for not working. Even Bogart questioned him on the wisdom of turning down some of the magazine writing assignments that were often offered to him. After relocating to Beaumont in 1923, Sadakichi continued traveling as often as he could or was commissioned to do, mainly back and forth between Greenwich Village in New York and Los Angeles. Around 1934, Sadakichi moved in with his daughter Wistaria Linton (Mrs. Walter Linton) on the Morongo Reservation. At this point his health had worsened and he was nearly destitute. The move was likely an economic necessity. Soon after his arrival on the Reservation his family and friends helped Sadakichi construct a small cabin he named “Catclaw Siding” on the Linton property. According to both Marigold and Tyron Linton (Sadakichi’s granddaughter and grandson) the cabin was appropriately named because of the overabundance of cat’s claw plants surrounding the property. Sadakichi lived there for another ten or so years as he continued writing, painting and entertaining his leftover Hollywood acquaintances, reduced to those able and willing to make the trek from Los Angeles to Banning. Fellow writer and friend Ezra Pound helped finance the building of Catclaw Siding. A humorous anecdote tells the story of one of Sadakichi’s closest Hollywood friends, W.C. Fields, who stopped at an eastside Banning gas station looking for directions to find Sadakichi after driving around lost on the reservation. “Where the hell is Sadakichi? !” an exasperated Fields shouted at the station attendant. He eventually found him and they spent the weekend sharing one of their favorite pastimes. Sadakichi’s one lifeline to his past and the art world was the U.S. mail. The Banning Post Office was located on N. San Gorgonio (present day Dorothy Ramon Learning Center) and was 2 ½ miles from Catclaw Siding. When Sadakichi first moved to the Linton property on the Reservation, the road was dirt. According to Tyron Linton the road was oiled in the late 1930s. 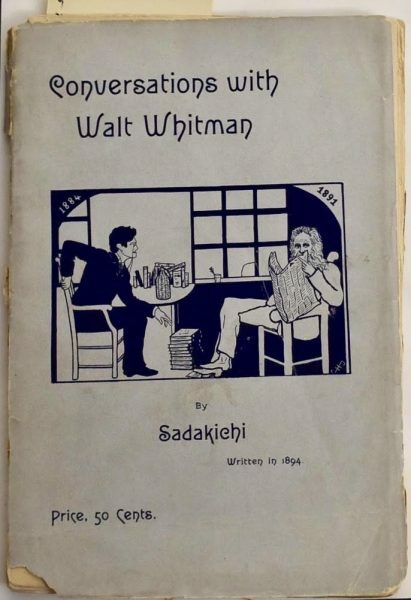 Sadakichi would walk the distance to the post office, or if lucky hitch a ride, nearly every day, hoping to find mail from someone who remembered him or wanted to employ his skills as a writer or lecturer. Some people can still describe the skeletal Sadakichi in his long, dark coat and fedora walking the dusty road to the Post Office. Ernest Siva, Director of the Dorothy Ramon Learning Center, remembers seeing Sadakichi waiting for a taxi on a bench on the northwest corner of 1st Street and Ramsey St. in Banning. “I never heard him talk. He just smiled with a twinkle in his eyes,” said Ernest. One of Tyron Linton’s earliest memories of his grandfather, Sadakichi, was when he accompanied him to the train depot in Banning on one of his many trips out of the area. Tyron, who still lives on the Linton property, was probably about five or so years old at the time. Sadakichi Hartmann in 1906, Strauss. Courtesy of UC Riverside Special Collections. I researched 18 years of Beaumont Mayor Guy Bogart’s diaries from the San Gorgonio Pass Historical Society’s Bogart Collection. Bogart felt the need to document every moment and every detail of every day of his life. He rarely expanded on his experiences, just notated the day and time they occurred. He would make an entry regarding Sadakichi as: “Lucy had a headache today, found our lost cat, pruned a peach tree and Sadakichi Hartmann called, or Sadakichi Hartmann came by for dinner.” He would make no mention of their discussion or any details as to their conversation. For a researcher this is very frustrating. What did they talk about?!! I was however able to use these diaries in conjunction with the correspondence between Bogart and Sadakichi from the UCR collection. Although Bogart had given Sadakichi a few hundred dollars over the years he never considered the money to be a loan. He felt it was a small price to pay for Sadakichi’s companionship, intellect and entertainment. There was probably some bartering involved as well when Sadakichi provided a line drawing of Mt. San Jacinto, titled San Jacinto From Bogart Bowl. Bogart used this drawing in many programs and promotional materials relating to the Japanese Cherry Festival programs at the Bogart Bowl. Guy Bogart, along with Sadakichi, created an authentic Japanese Cherry Blossom Festival designed as a tribute to international peace. This annual festival began in 1929 and changed during WWII because of anti-Japanese sentiments, then revived itself later as the present day Beaumont Cherry Festival. Bogart would often give Sadakichi rides to or from the artist John Decker’s studio in Brentwood where Decker, W.C. Fields, John Barrymore Jr., Anthony Quinn, Charlie Chaplin, and Sadakichi would often spend hours that would turn into days of drinking and philosophizing. 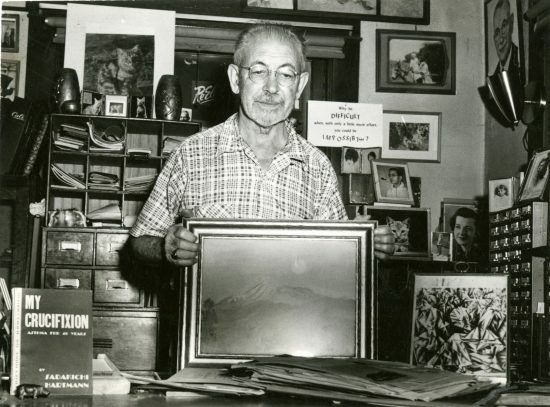 Guy Bogart holding Sadakichi’s painting of Mt. San Jacinto. Courtesy of UC Riverside Special Collections. UCR Special Collections has a photograph of Guy Bogart taken in his study, surrounded by numerous photographs of family and cat memorabilia. He is holding a painting by Sadakichi of Mt. San Jacinto. Other Sadakichi related items in the photograph are the cover of Sadakichi’s book, My Crucifixion, Asthma for 40 Years, and a small print of the famous Ben Berlin painting, Opus to Sadakichi, I934. 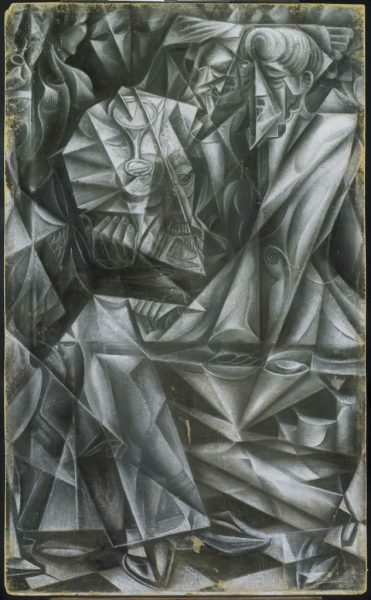 In a spring art exhibit in New York a 6×6 ft. painting of Hartmann was exhibited by cubist artist, Ben Berlin, hailed by Hartmann as America’s greatest cubist painter. He painted his Opus to Sadakichi in 1934. Somehow Sadakichi ended up with this painting and solicited Bogart’s help in selling it. He either purchased it after the exhibit in New York or Berlin gave it to him. Sadakichi was asking $350.00 for the painting but mentioned in a letter to Bogart that he would take $50.00. Bogart wrote back that he had offered the Ben Berlin painting to the Beaumont Public Library for $50.00. The library unfortunately declined to purchase the painting which would today be priceless. In November of 1937, Sadakichi and Walter Linton picked up the painting from Bogart’s house on Euclid Avenue. Here the trail goes cold in my research as to where the painting went from there. Does anyone in the San Gorgonio Pass recognize this painting or know where it may be? The Portrait of Sadakichi by Ben Berlin at the Phillips Gallery is similar to the missing painting, Opus to Sadakichi. “Is there a mountain more beautiful than San Jacinto on this earth?” asked Sadakichi at the end of one of his four poems dedicated to the beauty of the mountain. He described Mt. San Jacinto as “America’s Mt. Fuji.” Sadakichi painted numerous pastels of the mountain and wrote four poems entitled, Four Views of San Jacinto. At the approach of Spring I see the mount of San Jacinto as in a dream – a good omen? The snow on the summit resembles white silk with a silver greenish tint. Only the sheet lightening towards eve awoke me from the dream, as at the window of a shack I was waiting for the rise of the moon. The desert wind which caresses San Jacinto’s base and top alike also bears fragrance to all dwellers in San Gorgonio’s Pass. Bogart believed there were supernatural forces that surrounded Mt. San Jacinto, “It must be preserved not merely as a park but as a sacred altar. The Indians feel supernatural forces about the peak.” Bogart believed that as well. After the attack at Pearl Harbor Sadakichi, now about 72 years old, became a suspect for spying because of his dual German and Japanese ancestry. The U.S. Government determined he must be guilty of something, perhaps helping one side or the other. He was accused of climbing Mt. San Jacinto and sending signals to either Japanese or German intelligence. The 10,833 elevation would have been quite a task for an aging asthmatic but the Riverside County Sheriff’s Dept. put a tail on Hartmann, his relatives and associates, and followed them when they left the Reservation and went into town. Sadakichi loved to walk the desert at night making charts of the constellations. This was interpreted as proof he was somehow signaling Japanese bombers off the coast with a lantern. The FBI got involved and questioned him repeatedly although he escaped being sent to an internment camp along with thousands of other Japanese Americans during the climate of fear and paranoia at the beginning of WWII. The absurdity of the government’s suspicions eventually evolved into common sense and Sadakichi was left alone, no longer a suspect. About the author: Given his eclectic accomplishments, Bill Bell himself could be called the King of the Banning Bohemia. The son of a Southern Baptist minister who was also an accomplished Western songwriter and singer, Bill dived into the world of electronic music in LA in the late 70s, experimenting with synthesizers and later performing with pop and punk artists such as the Del Rubio Triplets and Josie Cotton. He studied music and film composition at UCLA, and worked on the score of the movie Kafka. 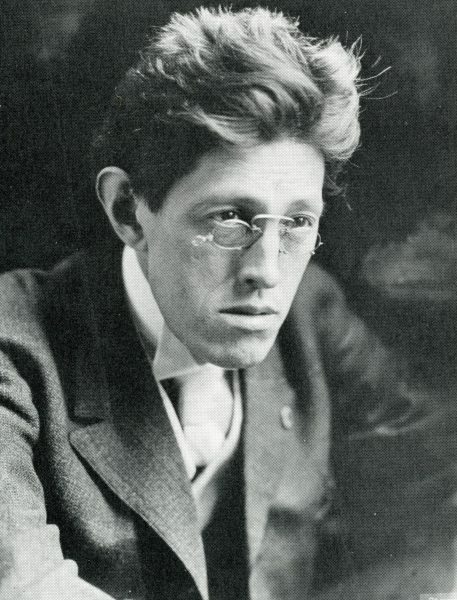 More recently he produced the Banning-based mockumentary Mysteries of Midgetville, as well as a cantata for choir and orchestra, The Other Wise Man. He has released CDs of his original fiddle tunes along with traditional American and Celtic fiddle music. Bill began to research San Gorgonio Pass history while working as a librarian at the Banning Library. He’s now an acknowledged expert on the subject. Author of the centennial book Banning, California: A Pictorial History Through the Decades, he has also added hundreds of Pass images to the Online Archive of California. He is married to the artist Gloria “Toti” Bell, owner of Toti’s Art Studio in Banning. Bill Bell thanks Wistaria Linton, Harry Lawton and George Knox. Special thanks to the Banning Public Library and its collection of books and newsletters by and about Sadakichi. Thanks to Marigold Linton, Tyron Linton, Betty Meltzer, Gloria Bell, Gae Rusk, David Heiss, and the San Gorgonio Pass Historical Society. inspiring to read of one of us who marched to his own drum, committed, strong and true to his path, as he listens! thank you dear ann! where else am i gonna’ find such fascinating stuff to read!